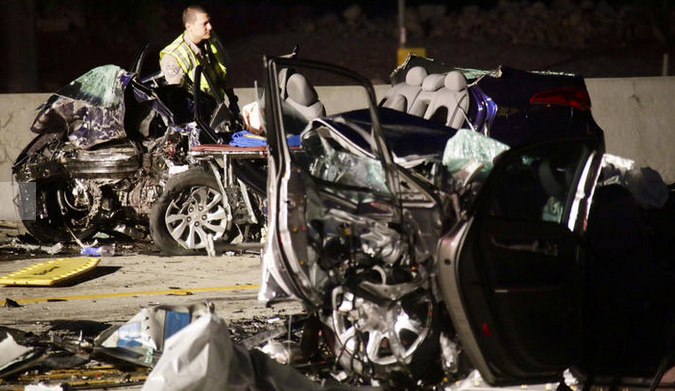 Three people were killed Sunday morning when a wrong-way crashed occurred on the 210 Freeway. The vehicle going the wrong way crashed into another vehicle near Deer Creek Boulevard and Rancho Cucamonga, according to the California Highway Patrol. The crash about 2:30 a.m. when the alleged wrong-way driver, driving what appeared to be a blue Hyundai, was heading west in the eastbound lanes when he collided with a silver Hyundai. The silver Hyundai had four occupants, according to California HIghway Patrol Capt. Joe Flores at a news conference. The crash killed the two back-seat passengers in the silver Hyundai and the driver of the blue Hyundai, according to Flores. The male driver and female front-seat passenger in the silver Hyundai were both seriously injured. One was taken to Loma LInda Hospital while the other was transported to Arrowhead Regional Hospital. Investigators are seeing whether alcohol or drugs were a factor in the deadly crash, said Flores. The names and ages of those killed in the crash were not immediately released by police officials.